Inverness midfielder Aaron Doran aims to continue his impressive Scottish Cup scoring run against Hearts at Hampden on Saturday. The 27-year-old Irishman has notched in every round so far this season - against Edinburgh City, East Kilbride, Ross County and Dundee United. 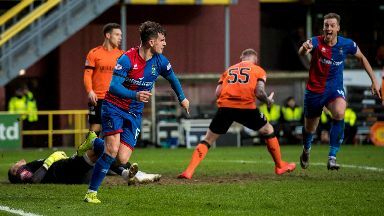 His stoppage-time winner against fellow Championship side United at Tannadice in the quarter-final last month started a four-game goal streak which took his tally to the season so far to 11. Doran won the cup with Caley Thistle in 2015 when they were a Premiership outfit and he is keen to help them through to another final, which would be against either Aberdeen or Celtic. "The Scottish Cup has been good for me this year," he said. "I think I have scored in every round so I want to keep that going on Saturday. "My form is good at the minute and I want to keep that going, I want to have a good performance on Saturday and hopefully celebrate after the game. "The last couple of months I have been making a lot more runs and the ball has been falling for me, like it did against Dundee United. "I will keep trying to do that and hopefully I can get a goal at the weekend."